Well bloggies – happy Friday. TGIF indeed. As of last night a secret I’ve been keeping pretty well is now out to most of my friends, so I figured I would share it would you readers, too. Tomorrow morning I am running my first post-surgery race. I would not say that I am looking forward to it, exactly – but I think it will be a good thing to do. On Tuesday I ran 3.3 miles, Wednesday I did the same and last night I walked from my office to the train at a really speedy pace (the walk is about 1.2 miles) and then I went to the gym talked to my trainer, and did the elliptical machine for just over half an hour. I am the worst at pre-race traditions. I try to keep everything the same (my diet, exercise routine, what I will be running in for the race) but it is inevitable that things change. Sometimes this stresses me out. Last night I started doing laundry to make sure that all of my clothing options for the race would be clean. I then discovered that I had lost a sock. Not just any sock – a sock that I do all of my running in. I used to have three pairs of these socks at one point. Now I am down to one and a half. Which means tonight not only do I have to get to downtown to pick up my bib number, I also have to get to City Sports where I might buy four more pairs of the socks. How is it that socks always disappear???? It drives me crazy. For breakfast I had a Kashi granola bar. It did the trick, getting me to lunch time which was about 12:20 yesterday. Dressed with a sprinkling of Newman’s Own lighten up dressing – the soy ginger flavor. Along with the salad I had a yogurt, with Kashi go lean crunch, chia seeds and flax seeds mixed in. I snacked on some grapes. At 2:30 I had the four peanut butter crackers. On the train last night I had the Adora disc. I did not get home from my day until nearly 8 o’clock last night and I was starving after my light gym workout. Thankfully my mom had everything well under control in the kitchen! This was an amazing chicken stir fry with vegetables. I asked for the cous cous on the side (some carbs!). 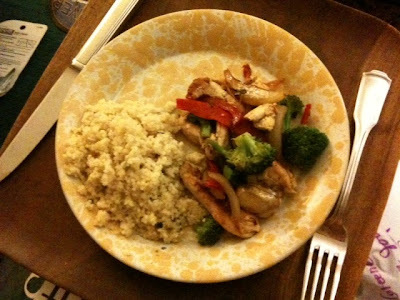 I loved this dinner and contemplated seconds, but I decided to save some chicken and cous cous for dinner tonight. The other day I went shopping and decided to try on some jeans. My friend took a photo and sent it to my sister for her opinion as he tried to talk me into them. I bought them because it is so hard to find jeans that fit well. They are still in the bag. I might try them on again tonight and decide. Previous Post Morning Run Routine..?